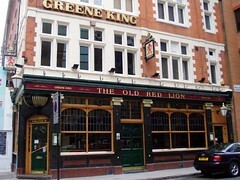 A decent Greene King pub on High Holborn, opposite the Penderel's Oak. It gets busy in here thanks to its prime location, but there's an upstairs bar as well which usually has seating available. There are seven handpulls on the main bar downstairs, with Greene King IPA, Old Speckled Hen and Abbot Ale. They may also serve a guest ale. It's usually a decent bet for a drink in the area. Last visited by Ewan and others, 7 May 2009. Last edited 2011-06-26 14:30:45 (version 2; diff). List all versions. Page last edited 2011-06-26 14:30:45 (version 2).